All teenagers have problems, but few of them can match those of Aislinn, who has the power to see faeries. Quite understandably, she wishes that she could share her friends’ obliviousness and tries hard to avoid these invisible intruders. But one faery in particular refuses to leave her alone. Keenan the Summer King is convinced beyond all reasoning that Aislinn is the queen he has been seeking for nine centuries. What’s a 21st-century girl to do when she’s stalked by a suitor nobody else can see? A hot, yet aggravating faerie king, a scheming faerie queen, an exceedingly adorable best friend and a tough human girl, born with the Sight. Add all of that together and you have an enthusiasticly fun, romantic read. Aislinn is a girl who has somehow, always been able to see faeries. Having the Sight is not a gift, it’s most definitely a curse. Where others can go about their lives oblivious to the dangers lurking around them, Aislinn has to pretend she can’t see them, or something very bad could happen to her. That’s what her grams, her sole guardian, has been drilling into her ever since she was a child. She has become quite good at the ignorance-and-avoidance game, but that all changes when Keenan, the Summer King, decides to make himself visible to her. Even faeries in human-form don’t deceive her though, her Sight sees right through their glamours. Aislinn wants nothing to do with him, no matter how incredibly desirable he makes himself appear. Not with Seth, her facial-piercing-loving, completely adorable, not-quite-boyfriend-friend around. Determined to win Aislinn over though, Keenan goes to great lengths to woo her. He’s convinced he needs her so greatly, that some of his actions could be seen as bordering on stalkerish. That is if he wasn’t so unbelievably hot. A fact we are reminded of constantly. I rushed through this one, after a week of no reading. Exams and studying don’t bode well with getting through my TBR. 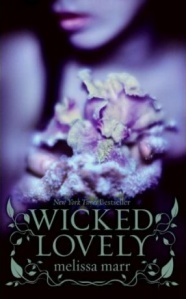 I’ve been putting off this series for a while, but after reading Wicked Lovely I have no idea why. I adored Seth, he was such a cute, fun, and sometimes too caring character. He exudes love for Aislinn, how she could be blind to it, was beyond me. Keenan on the other hand, he annoyed me, but that was kind of his purpose. Pushy, impetuous and way too full of himself. I loved Aislinn’s ability to put Keenan in his place. Mostly, she was strong-willed, but there were a couple times when I was wondering what she was doing and how she could possibly rationalise it. Her insistence that faeries are evil beings that hurt people seems to escape her at times, while at others, she can be as focussed as ever. Her friends from school seemed tacked on, and didn’t really fit. They hardly seemed like people Aislinn would get along with, more like a bundle of peer pressure and gossip. Donia was a great character though. Previously a mortal, she was cursed as the Winter Girl, a fae imprisoned by the Winter Queen’s ice poisoning her body. As Keenan’s last, but not true love, Donia has been isolated, living with the chill ever since. Although she should be bitter, she actually has a detached kindness to her that holds her apart from the other fae. The faerie world felt incredibly real, existing in the background of our own. I got lost in this story as I sped through the pages today. The twists weren’t hugely earthshattering, but it was an addictive read nonetheless. If there were only one reason to read this, it would be for Seth. I undoubtedly plan on buying the rest of the series in the next few days. Those who love strong female characters, romantic guys and an ample amount of scheming faeries. Great review! I felt much the same way about this book. I keep meaning to read the others in the series but never quite get around to them. I almost bought Wicked Lovely this week, then I put it back on the shelf and I’m wishing I didn’t. Now I have to go back and get it, Great Review!